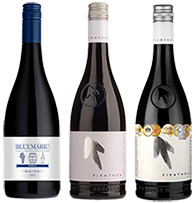 A bold range of Australian wines rich with flavour and alluring aroma. Bluemark, Pirathon Silver, Pirathon Black & Pirathon Gold. Award Winning Shiraz Don't just take our word for it. Here are some awards we have won. Pirathon is an ancient word for pinnacle and we believe Shiraz is the pinnacle grape of the Barossa and that the north-western Barossa is the pinnacle sub-appellation for Shiraz. The grapes for Pirathon Shiraz are traditionally handcrafted in open top fermenters and basketpressed before maturing in barrel. Each vineyard adds its own exclusive dimension to Pirathon Shiraz and combined they produce the ultimate blend. 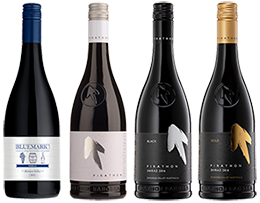 Pirathon Shiraz showcases and celebrates the pinnacle north-western Barossa region and pinnacle Barossa grape with a complex and distinguished wine. Pirathon are proud to use screw cap closures for our wine which are at the forefront in an advance in improving the quality of bottled wine. ReviewsWhat wine critics have to say about our wine. “Totally classic Barossa, a mix of North and Western subregions, a range of microclimates that deliver big, rich fruit. The resulting juices also offer attractive aromatic lift above the obvious impressions of traditional oak maturation, which impacts the start but still allows that fruit to keep powering through. Plump generous, steady Barossa shiraz that hangs your senses and leaves you without any doubts about where you’ve been"